The ROLEC DH units utilize the Ampco SBI pump to safely induce dry hop pellets, fruit, spices coffee and more directly into the stream of beer while recirculating the fermenter. The systems use carbon dioxide (CO2) to purge oxygen from the hop chamber. 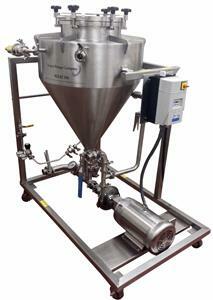 Pellets can be induced into fermenting, finished, or crashed beer. The chopper pump creates a differential pressure for induction from the vessel. The pellets and other media is chopped to maximize the surface area, flavor and aroma.